Walking is one of the most effective forms of exercise. It is also a great way to enjoy cutural and leisure activities in the city. 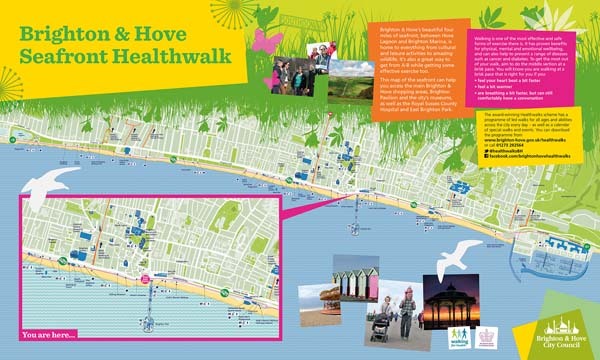 The Signed Seafront Healtwalk Route covers four miles of seafront between Hove Lagoon and Brighton Marina. There are regular information boards along the route and distance markers so that you can see how far you've walked. The map also has information about how to get to the popular parts of the city, such as the shopping areas on George Street and Churchill Square, Brighton Pavilion and city's museums.